The air we breath and the vaccinations we receive are poisoned with deadly chemical cocktails linked to multiple diseases such as Fibromyalgia, Chronic Fatigue Syndrome, MS, Parkinson’s, Alzheimer’s, Cancer, Diabetes, Arthritis, Autism and AIDS. Chemtrails and vaccines are silent deadly killers. This outstanding article makes it crystal clear what we are up against. 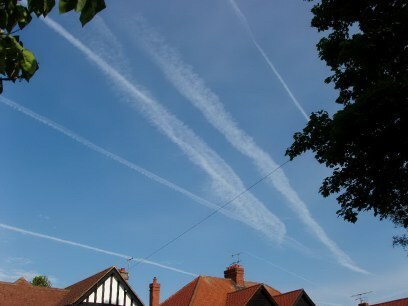 We can’t do anything about chemtrails, but we can refuse vaccinations. DO NOT GET YOUR CHILD VACCINATED FOR GARDASIL – IT HAS ALREADY CAUSED 144 REPORTED DEATHS AND SERIOUS HEALTH COMPLICATIONS – Another corporate money making machine, which also causes infertility in boys and girls. SHOCKING INFORMATION – EVERYONE MUST READ! Chemtrails block the sun and cause significant, deliberate weather modification, they destroy crops and they devaste human health. Chemtrails contain high levels of Aluminum, Barium, Strontium-90 and Lead, as well as trace amounts of other chemicals including arsenic, chromium, cadmium, selenium and silver. BARIUM: Small amounts of water-soluble barium can cause a person to experience breathing difficulties, increased blood pressures, heart rhythm changes, stomach irritation, muscle weakness, changes in nerve reflexes, swelling of the brain and liver, kidney and heart damage. Toxic barium levels may be an origin of Multiple Sclerosis. STRONTIUM-90: If this compound dissolves in water, the chemical will dissolve in the moist surface inside the lungs. Strontium will then enter the blood quickly. If the chemical form of strontium does not dissolve in water easily, a small amount may remain in the lungs. Health problems can develop including lowered red blood cell counts including anemia, which causes excessive tiredness, blood that does not clot properly, and a decreased resistance to fight disease. Besides MS, this bacterium has been linked to a variety of diseases including; AIDS, cancer, diabetes, Parkinson’s, Alzheimer’s and arthritis. In 2000, Dr. Charles Engel of the National Institute of Health stated that the brucella mycoplasma was probably responsible for chronic fatigue syndrome and fibromyalgia as well. 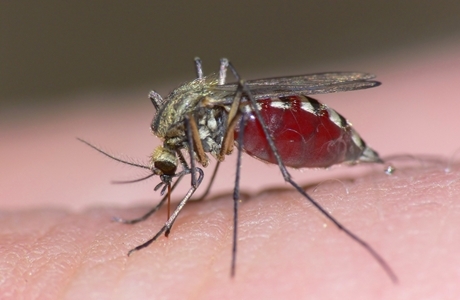 Government mosquitoes raised to carry disease. In 1993, Dr. Shyh-Ching Lo, senior researcher at the Armed Forces Institute of Pathology patented several virulent strains of mycoplasma. He stated in his own patents that they cause chronic fatigue syndrome. The Institute is currently reconstructing the 1918 Spanish Flu, inserting it into contemporary flu strains and enhancing its lethality. The Spanish Flu killed 675,000 Americans in the 1918-1919 interval. Many of the dead were vaccinated soldiers. Anyone born after 1918 has no immunity to the Spanish Flu. Since 9-11 all US airports have been under military control. According to one credible source, there is a subrosa project known as ‘Project Cloverleaf’ that uses domestic air carriers retrofitted with special tanks to spray civilian populations with a variety of chemicals. Photographs don’t lie – they are evidence of our daily destruction. or Stratospheric Aerosols, or Geo/Climate Engineering. 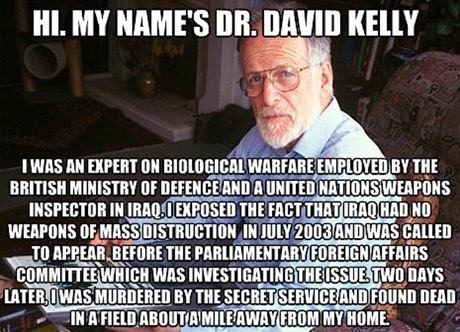 Dr. David Kelly – Murdered. At least two dozen microbiologists around the world have died violently in the last few years. Curiously, some of them were working on DNA sequencing. The most famous was Dr. David Kelly (Dr Kelly was said to have swallowed 29 coproxamol tablets, only one-fifth of one tablet was found in his stomach, and the level found in his blood was far less than a fatal dose) who died in July 2003. Working for the Mossad, Kelly orchestrated the defection of Russian microbiologist Vladimir Pasechnik, who had been working on a doomsday biological weapon capable of destroying one third of the planet’s population. The Times reported on the dangers of tainted vaccines as far back as February 1962. It turns out that the polio vaccines of the 50’s and 60’s were virally contaminated with diseased monkey kidney tissue, possibly accounting for the huge spike in cancer cases thereafter. 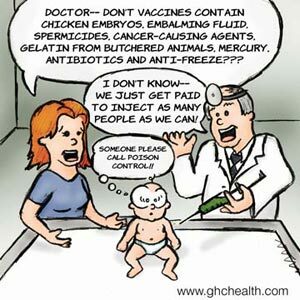 The Physician’s Desk Reference for 1998 lists any number of toxic vaccine ingredients including; mercury, formaldehyde, aluminium, phenoxyethanol (antifreeze) and human diploid cells (from aborted fetal tissue). Also animal tissues and fluids, including horse blood, rabbit brain, dog kidney, monkey kidney, chick embryo, chicken egg, duck egg, pig blood, and porcine (pig) protein/tissue and calf serum and fetal bovine serum. Innocent Africans are deliberately infected. The Times also reported last December that Gulf War Syndrome had been positively linked to vaccines. More than 100,000 veterans currently suffer from the syndrome contracted in 1991 during Desert Storm. Over 20,000 veterans have died so far – tens of thousands more will be infected from the current Iraq and Afghanistan illegal US war and occupation. Government vaccine experiments using children. The Nazis conducted the same experimentation. In April 2000 the Observer newspaper reported that the pharmaceutical leviathan GlaxoSmithKline sponsored experiments on children at Incarnation Children’s Center in New York City. Children as young as four were given multi-drug chemical cocktails. In other experiments, six-month old babies were injected with double doses of a measles vaccine. More than 100 orphans and babies were used in 36 experiments. This sort of experimentation has occurred with increasing frequency. Last year the Environmental Protection Agency received $2.1 million from the American Chemistry Council to conduct studies on children from impoverished families in Duval County, Florida. The children will be exposed to a variety of known toxins over a two year period. The study will determine how chemicals are absorbed, ingested and inhaled by children ranging in age from infants to 3 year olds. For taking part in the study, families will receive $970 and a tee-shirt (and later on a dead child). FACT: You do NOT have to have your child vaccinated! 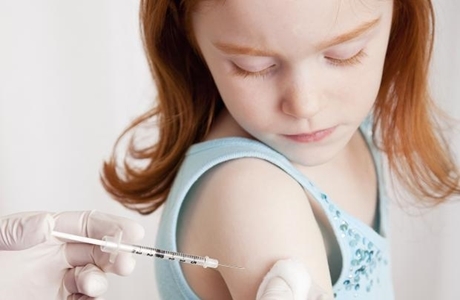 Children without vaccinations grow-up to be healthier adults. Also, before consulting a doctor, it may be prudent to consider the prestigious Journal of the American Medical Association vol. 284 July 26, 2000. Therein is stated with astonishing frankness that American medical doctors are responsible for 250,000 deaths per year. Half of these deaths are attributed to the negative effects of wrongfully prescribed drugs. Interestingly, in the opening statement of the Hippocratic Oath, doctors make a declaration to a Greek God, Apollo. In the Greek vernacular, the word Apollo means destroyer. 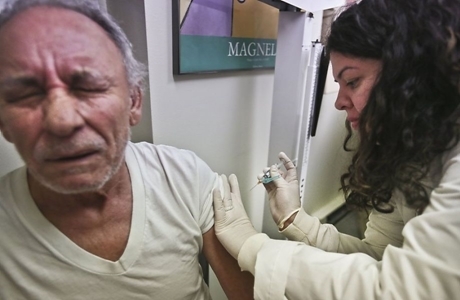 Grandpa being injected with potentially lethal flu shot. 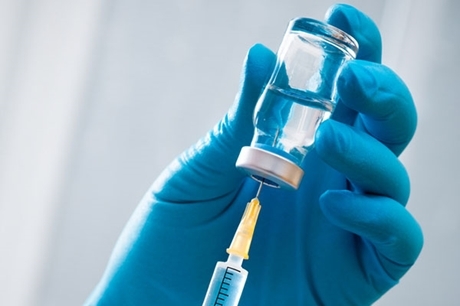 It may also be prudent to heed the advice of former National Institute of Health director James Shannon who stated, “The only safe vaccine is the one that is never used.” This advice certainly resonated with President George W. Bush. On October 13 of last year in the middle of the US Presidential debates, Bush emphatically declared, “I haven’t got a flu shot and don’t intend to.” (Bush and co own the pharmaceutical corporations that supply the vaccinations and drugs that poison and kill us). The author of this website skipped childhood vaccinations and chose not to vaccinate her son – both of them are 100% healthy and NEVER get sick, not even a cold! Her son’s high school tried to refuse enrollment due to no vaccinations, but finally admitted after 30 minutes of argument, there was a waiver form. Many parents routinely subject their infants and toddlers to more than 63 vaccinations before the age of five. Aproximately 1 in 88 children now develop AUTISM, as of 2012 – the numbers continue to climb every year. The vaccinated child becomes virally active and for the next 21 days is shedding the virus every time he/she enters a room, coughs, sneezes or just breathes. And now, with their immune system compromised by the vaccine, and with the ability of recombinant DNA to mutate and create new viruses in their little bodies, your vaccinated child becomes a viral incubator. ASK YOURSELF why will unvaccinated kids be a threat to vaccinated kids, if vaccines work?! GARDASIL and CERVARIX VACCINE: Gardasil is DANGEROUS. Gardasil causes BAD reactions and has caused numerousl DEATHS. The US and UK governments have given millions of dollars of taxpayers money to Merck, the Big Pharma firm, to buy this untested vaccine that has a history of deaths and bad reactions from those who have received the poisoned cocktail. The targeted market for Gardasil is young women and teens, both male and female. H1N1 – DO NOT GET VACCINATED. The H1N1 virus was CREATED in laboratories and the vaccine patented by Baxted International BEFORE the ‘Swine Flu’ was unleashed in Mexico. FLU VACCINES vaccines have caused more deaths than the flu itself. RESEARCH THIS TRUTH FOR YOURSELF. Vitamin D (and liquid Vitamin C) protects the body from flu – Get out into the sunshine for 15-20 mins a day and eat fish (wild salmon), as often as possible. If you don’t like fish and you receive little sunshine, cod liver oil is the best alternate option. Everyday you go outside, you are breathing in toxic metals which are slowly destroying you, me, our children and our planet! DAILY DETOXIFICATION IS MORE CRITICAL THAN EVER BEFORE. The frequent profuse spraying of toxic chemtrails affects every single one of us. Eat healthy, exercise and get enough sleep, to protect your immune system. Deadly vaccine cocktails and drug medications need to be expelled from the body – better yet, don’t put them in your body in the first place! Specific motion energy detoxes the body via the Lymphatic system. Far Infrared detoxes the cells of heavy metals and poisons. seniors or those with weak immunity. According to a Johns Hopkins Study, Eating Too Much Salad can Cause … Autism!